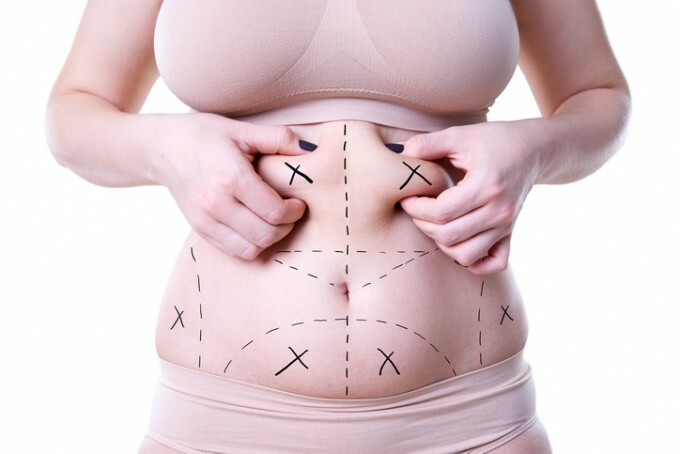 Tummy tuck for a flat stomach : is it for you ? Home/Non classé/Tummy tuck for a flat stomach : is it for you ? Multiple pregnancies and major weight fluctuations can damage the stomach area. When the skin stretches to accommodate weight gain, stretch marks can appear and abdominal muscles lose their tension (which provides central core strength). This results in an unsightly appearance as well as a protrusion of the stomach, and this is the main reason why patients request a tummy tuck. The traditional abdominoplasty approach repairs the damaged stomach area. The mini tummy tuck is a localized procedure that corrects a mild protrusion of the region located between the belly button and the pubis. The skin can be stretched, but good elasticity must remain. Liposuction is frequently added to the operating plan in order to remove excess fat. Is tummy tuck possible for me ? The skin of the stomach is significantly stretched and includes stretch marks. The stomach is deformed with an ‘apron’ consisting of excess tissue (called pannus) hanging over the pubic region. The patient accepts the scar resulting from the incision. A female patient is planning to have a or another children. The patient is a heavy smoker (more than 1 pack per day). The patients wants to lose weight more than the aesthetic result provided by the procedure. What if I really want a tummy tuck ? If you’re a heavy smoker, you have to agree to stop smoking during three weeks before surgery and two weeks after to facilitate wound healing and lower infection risks. You have to lose weight before the procedure, which should always be the way to go for any patient requesting a body contouring surgery.